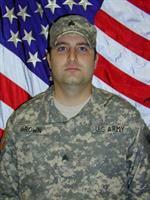 Sergeant (SGT) Jeffery Brown, 25, of Trinity Center, California, served as a helicopter crew chief. He entered the Army in July 2000 and arrived at Fort Riley in September 2003. SGT Brown died as a result of a helicopter crash August 8, 2006 when the UH-60 Black Hawk air ambulance helicopter he was traveling in crashed into a lake in the vicinity of Al Anbar Province, west of Baghdad. This was SGT Brown's second deployment to Iraq with the 82nd Medical Company out of Fort Riley, Kansas. SGT Brown’s younger brother was an Apache helicopter crew chief based in Germany at the time. A 2000 graduate of Trinity High School, SGT Brown started at fullback on the football team that won the North State Championship. He was an outdoorsman, loved riding motorcycles, and came to embody California’s “laid-back” lifestyle among his fellow soldiers. SGT Brown is survived by his wife and two children, one of which is a Folds of Honor Higher Education scholarship recipient.